This is where it begins – the baptism of Jesus. In all the gospels it is the baptism of Jesus where the story really begins. Everything before is merely prelude (although, using the term “merely” does an injustice to what Kelly’s preludes do for us). The last few weeks – looking forward to Jesus birth through Advent and then the actual celebration of his birth at Christmas – all of it is prelude. 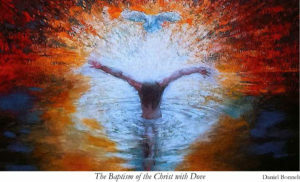 For the gospel writers, this is where it begins – the baptism of Jesus. The child is born and then we fast forward, with a brief pause when he was twelve, to the adult Jesus, as if his first thirty years of life didn’t matter. Whatever, Jesus’ baptism is the real beginning. This is when his mission begins. Here Jesus rises up out of the water, anointed by the Holy Spirit ready to live out his calling. Much lies ahead for Jesus. He must live out his identity and meet the expectations laid on him. Look how John has already spoken about the anointed one to come. See how the people project their hopes and desires onto him in the coming months. In the same way, and I really mean in the same way, our baptism is about being named a child of God – a child with whom God is delighted. “You are my child with whom I am well pleased,” says God. The words embrace us and promise to hold us. So it is that the most significant meaning of baptism is that we belong to God. Our Reformed tradition makes this abundantly clear. Baptism is said to be a sign and symbol of inclusion in God’s grace. Baptism is the seal of incorporation into Christ. It signifies our adoption into the covenant family of God. So our baptism is a deep, rich, multifaceted sign and symbol of God’s delight in us. In baptism we are declared God’s child. We are called by name. Through baptism, God reveals to us our identity as redeemed creatures. Out of that calling of identity we can live out of the delight God finds in us. We are called to live out of the grace that has been freely bestowed on us in baptism. And when it comes down to it that is what discipleship really is – living our lives in the grace of God. And, of course, that’s what we do … sort of. We would like to say that this is how we live, but it often doesn’t quite happen. We would like to say we live completely aware of God’s grace given to us, but we don’t really. We would like to say we are true disciples, but we know we often fail, sometime miserably. We would like to say we live by the calling of our names, but we sometimes think that God is more like a stranger than the one who calls us by name. We would like to say we live our lives in the glow of God’s delight in us, but we sometimes live in the shadow of fear and judgment. We live in the shadow of fear and judgment because that is how we often think of God. Instead of living in the glow of God’s delight we are apt to live with anxious feeling that God is looking over our shoulder ready to pounce on us when we mess up, or think unclean thoughts, or don’t ready our bibles everyday as we should. I must say this is how I lived out my faith growing up. Oh, believe me, I was an ardent Christian. But delight in God’s free flow of grace – not really. Oh, I was proud to be a Christian, assured by my church that I believed all the right things, that I’d experienced a true conversion experience, that I was a “true believer.” But that pride expressed itself in pity or disdain for those who hadn’t been converted, appeals made to hurry and get saved or they would miss Jesus’ return and end up in hell. I’d often lay awake at night wondering if I truly was saved, which turned into fervent prayers trying to assure God that I really did believe. One could never be too sure. Even though the message of God’s love for me was sometimes spoken of, it was the never-satisfied, angry God that dominated my experience. As a got into college, married life – Christian ministry, I sought to soften that harsh personal experience of God. I spoke more deliberately about God’s love in my inner-city church work. I was more patient with the people with whom I ministered, despite the pressure to get as many saved as quickly as possible. I came to realize that God’s love often works in subtle and quiet ways, slowly. I learned that a trite “just trust in God” didn’t work. And I learned that the people of my congregations struggled with the same fear and judgment of God that was at the root of my faith growing up. So it was, after several years of doing this, I came to the point when I realized my theology, the theology of, frankly, my Evangelical upbringing, just didn’t work for me anymore. It didn’t work for my congregation. And it certainly wasn’t working for me. So, I quit. I quit being a minister. This was a fatal blow to my Fundamentalist identification and a huge blow to my faith. For months afterward I entertained severe doubts about God. I had discarded the religion of my youth and had nothing to replace it. I spent several months in depression, mourning the loss of my youthful dreams, totally disillusioned. We knocked around for a couple of years after that. We got re-involved in a church we’d been a part of years before. People of the church, our friends, were very supportive. They demonstrated much patience; didn’t try to cajole us or pressure us. But it was hard. I’d often leave during the sermon (the preacher was and still is today a life-long friend) and walk around the neighborhood. I was a mess. I guess I would say that despite the support we received, it was too closely related to the tradition which I had quit. I had look elsewhere or give it up completely – and I mean, completely. One day a symphony chorus friend (Linda and I sang with the Colorado Symphony Chorus) said, “you should come visit my church. We have really good music.” So, we gave it a try. And we were overwhelmed with grace – God’s grace! Everything about it, the liturgy, the really good music, and especially the sermons, exuded God’s grace. And thus began our ten-year journey of renewing our faith at Montview Blvd. Presbyterian Church in Denver. The word of grace was like a clear, cold Rocky Mountain stream from which I could dip my tin cup and quench my parched grace-deprived soul. It so happened that in my time at Montview I was affirmed in my ministerial skills and abilities by the pastoral staff and members of the congregation. They even allowed this former Baptist to preach on a few occasions. My life was overwhelmed with the experience of God’s grace. And that’s why I am a minister today. Oh, of course, I’d heard about grace before. I had preached grace to some degree. But I never quite got to the place of embracing and preaching an unconditional, overwhelming grace. Instead, my approach to grace was how Christian writer, Phillip Yancey, put it: We (Evangelicals) believed we were saved by grace, but then we spent the rest of our lives trying to prove to God that he didn’t make a mistake. So, we dived into this new pool of grace, luxuriating in God’s delight. I eventually, through much study, of course, came to believe that God’s grace is so big, so overwhelming, that if there is, indeed, a heaven, everyone gets in. No exceptions. Unconditional grace. That, to me, is the message I should hear when I remember my baptism. I am beloved by God. Of course, that’s how I live my life…sometimes. Despite what I know in my head I don’t live up to the fullness of my baptism. Despite our experience of baptism we don’t fully live by the calling of our baptisms. Despite the experience of God’s grace and acceptance we often really doubt the reality of God’s delight in us. And as a result our discipleship is less then it could be. And we don’t experience all the joy baptism was meant to convey to us. So I also say: Remember your baptism! For in your baptism is symbolized this most important truth: You are greatly loved by God. God has called you by name and God finds great delight in you. Nothing can separate you from that truth. Your baptism is a sign of that truth. So, when you, in your youth, feel overwhelmed with a world that scoffs at faith: Remember your baptism! When you, in middle age, start to realize, as have I, that you are probably on the downhill side of life, that there are fewer years left then have been lived and you haven’t accomplished all that you thought you would and a sense of disappointment creeps in: Remember your baptism! When you, in your senior years, see your friends and spouses leave this world and realize that your years are also coming to a close and you fret about what follows: Remember your baptism! When we all wonder what good we are trying to be the church in this place and we ask, “Is it worth it”: Remember your baptism! Indeed, on this Sunday, this Baptism of Christ Sunday, we do remember our baptism. We will do that this morning by participating in a congregational reaffirmation of our baptism. If you aren’t baptized? Well, I encourage you to consider it. In reminding ourselves of the importance of our baptisms may we settle in just a bit more to that place in our hearts and in our lives where we might once again know and believe God’s delight in us. We are beloved. Amen.